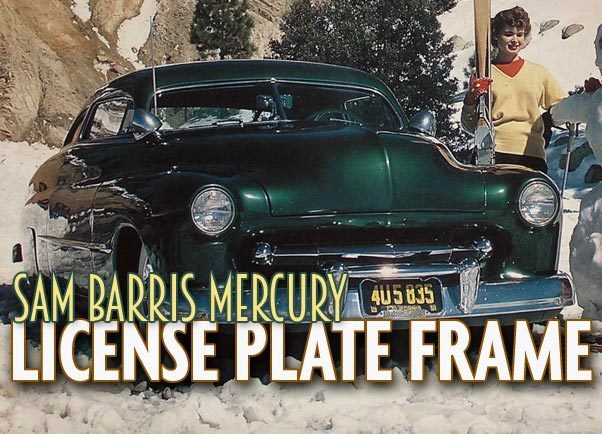 Sam Barris used Dealer License plate frames on his trend setting 1949 Mercury back in 1951. Rather unusual for a Custom Car with all its external emblems removed. I shared this finding with some of my Custom Car friends asking if they ever heard about Lundstrum Motors in the LA area. And discussed the thought that possibly this was the dealer where Sam Barris had bought his used ’49 Mercury from. No new info came up, so I shared the enlarged photo showing the license plate frame on my Facebook asking for help. And within hours some great information came up. 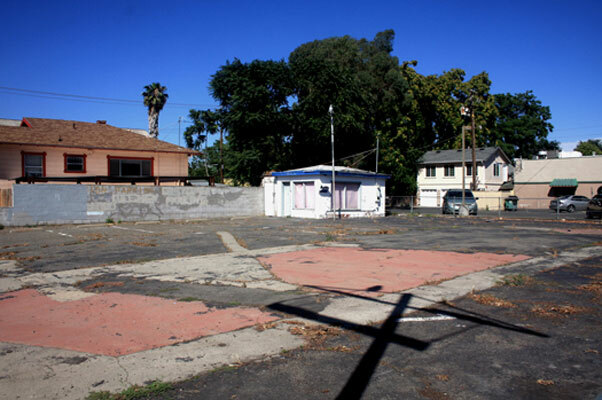 Howard Gribble had found a link to Lundstrom Motors in Sacramento who opened a used car lot at 1801 Broadway in 1951. I know that Sam chopped his Mercury in early 1951, so it could be possible that this was the place where Sam might have bought his used Mercury from. But I also heard that before Sam chopped his ’49 Mercury he drove it around for some time. Not long after that Mats Olsson from Sweden shared some information about Lundstrom’s Mercury-Lincoln Dealership and Service at 1631 K Street in Sacramento. This dealer was founded in 1941 by the Wisconsin-born Fred Lundstrom. Photo taken by Marcia Campbell at the last day Sam Barris owned his ’49 Mercury. 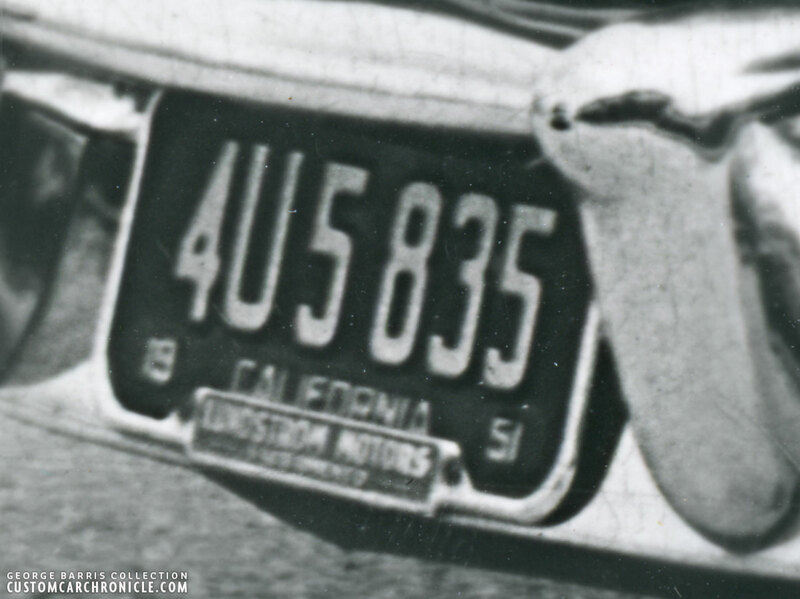 I appears that the whole text on the frame reads: LUNDSTROM MOTORS – SACRAMENTO –. So most likely Sam Barris bought his second hand 1949 Mercury Coupe at either the Mercury-Lincoln Dealer on 1631 K Street, or at the used car lot run by the same dealer on 1801 Broadway. 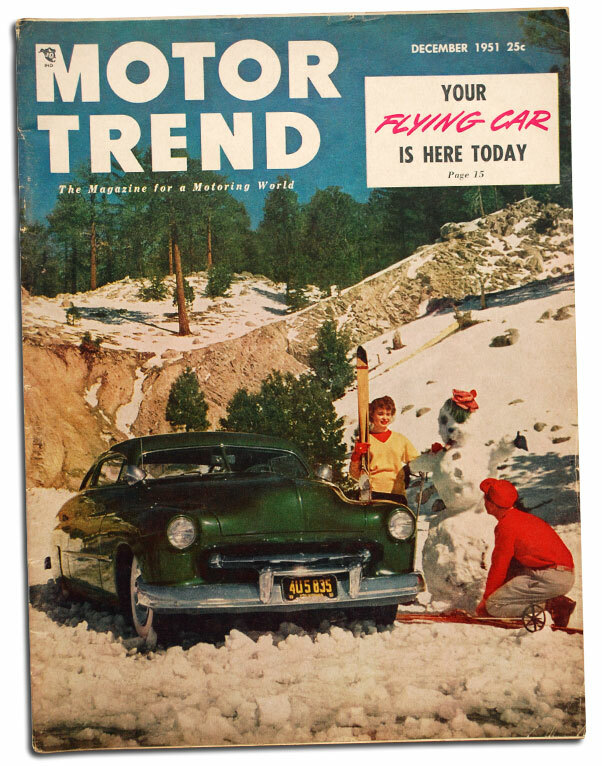 And later this car would be the trend setting chopped Custom Mercury featured on the cover of the December 1951 issue of Motor Trend magazine. 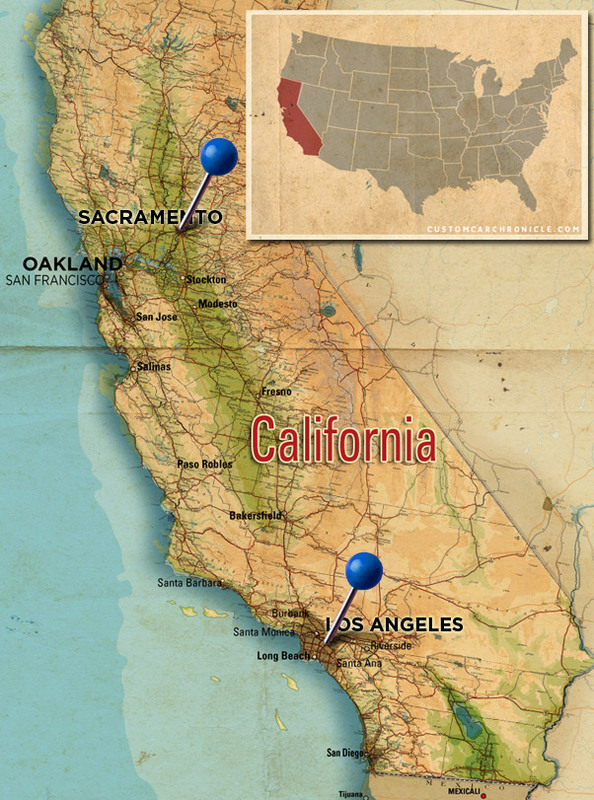 We do not know for sure when Sam Bought his Mercury, but we do know that Sam grew up in the Sacramento area, and that he really loved it out there, better than in the LA area where he lived from the mid 1940’s up to around 1956. We also know that Sam and his wife kids try to spend time with old friend and family in the Sacramento area. So quite possible Sam found the used ’49 Mercury on one of his trips up North. Then the question comes, why are the Lundstrum Motors license plate frames still on the car after it was customized? It is kind of odd to use these Dealer Frames on a completely smoothed custom in 1951! Could it be that Lundstrum was a friend of Sam, and perhaps it was a way of sponsoring? At the time when Sam bought the car he must have known it would end up being customized. 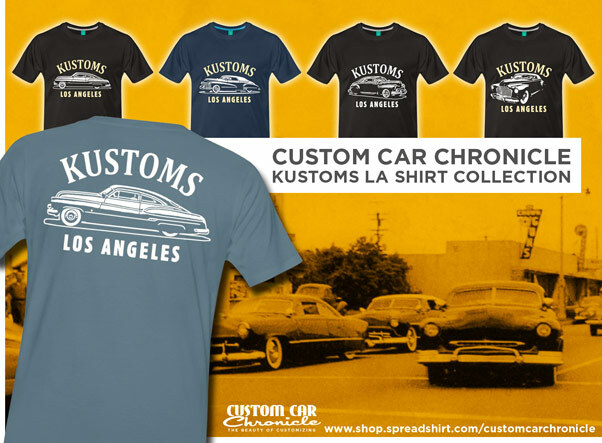 And at the time the Barris Shop was already very famous, so having the Lundstrum name connected to the Sam Barris custom might mean some extra business. Possibly Sam got the car a bit cheaper if he would keep the Lundstrom frames on the car? But all this is speculative… I have no idea why the frames are still on the car. From the photos I have seen it looks like both the front and rear used the Lindstrom frames, and I can see them on all the old photos of the car, including one taken in October 1951 at the Indianapolis Hot Rod show after the car had been sold. 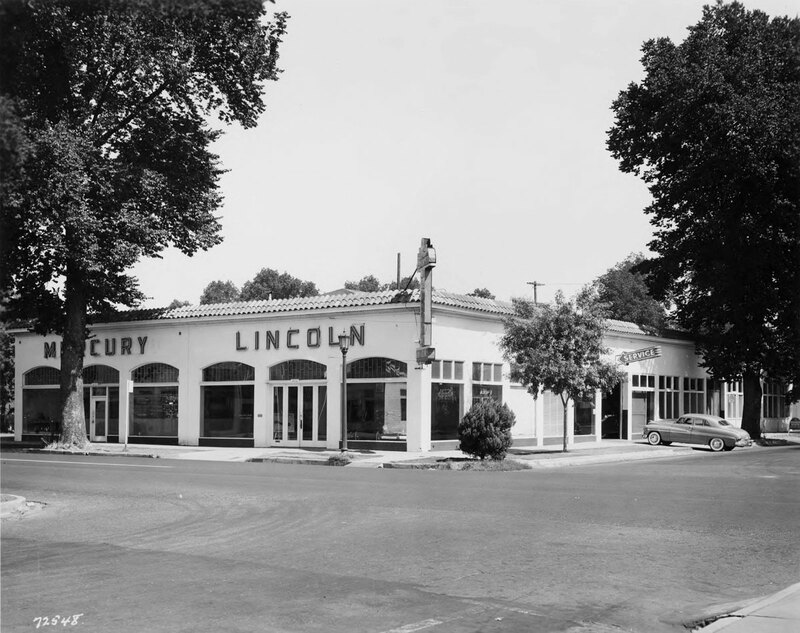 Lundstrom’s Mercury-Lincoln car dealership is pictured at 1631 K Street in this July 25, 1948 photograph. That must have been a brand new delivered ’49 Mercury four door parked in the entrance of the Service section of the dealer ship. Perhaps this was the place where Sam bought his used ’49 Mercury around 1950, or early 1951. Just a neat little detail about the Custom Car Icon Sam Barris ’49 Mercury I had never ever seen even after I had examined those old photos to many times before. 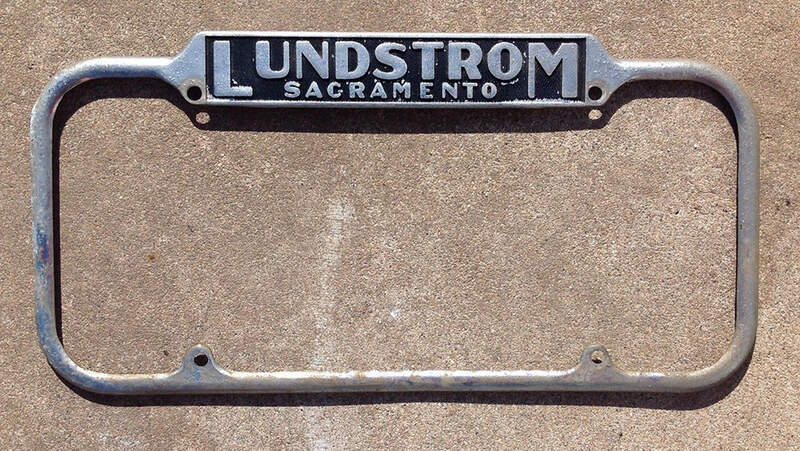 How great would it be if somebody had one of these old Lundstrom Motors license plate frame laying around and could donate them to be used on the restored Sam Barris Mercury. Right now the restored car has the plain frames on it, those frames were the number one choice to use back then. 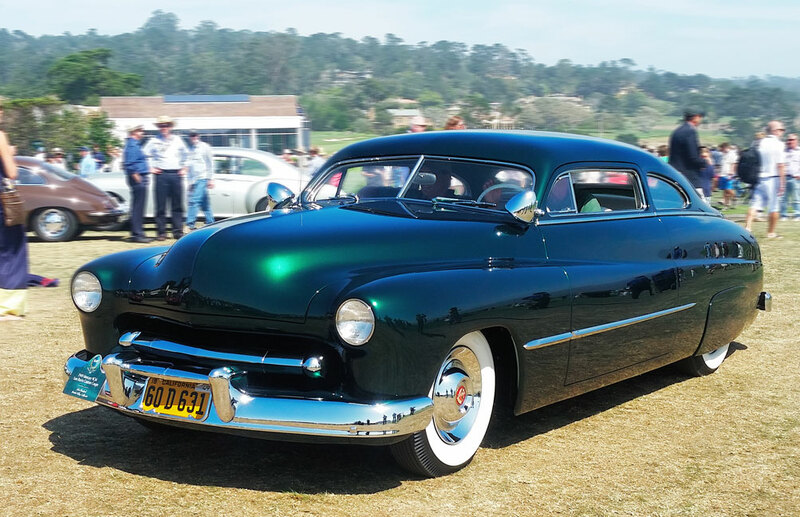 The restored Sam Barris 1949 Mercury at the 2015 Pebble Beach Concourse. 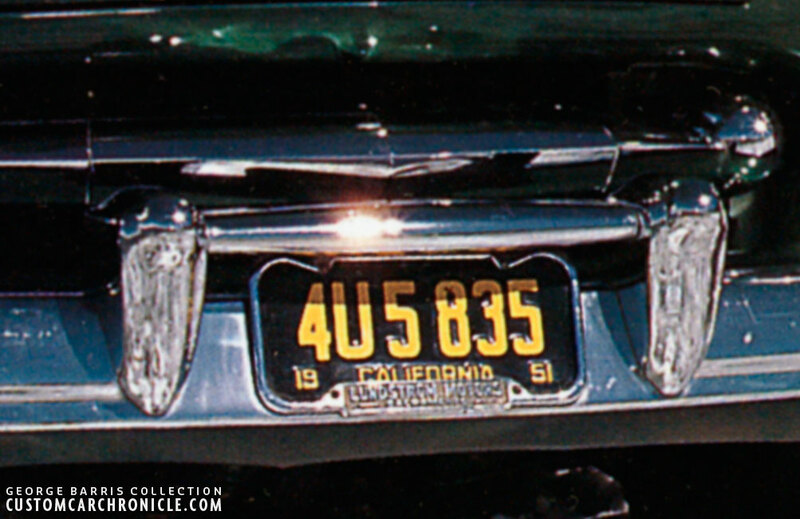 The car uses plain chrome plated license plate frames. 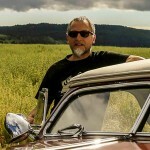 I want to especially thank Mats Olsson very much for once again finding all the great info. He also was able to track down the famous Marcia Campbell Line-Up photo shoot location some time ago. Interesting Rik, does it have the same licence plate frame on the rear? I do not have a clear photo of the rear to know for sure, but it sure looks that way.